One of Katarina Line’s traditional wooden ships. Mario Almonte photos. A Katarina Line Deluxe Superior vessel. Katarina Line is a tour operator and small cruise ship company that is based in the European nation of Croatia. From the end of April to the middle of October, Katarina Line offers weekly guaranteed departures from Croatia’s major tourist centers of Dubrovnik, Split, and Opatija. 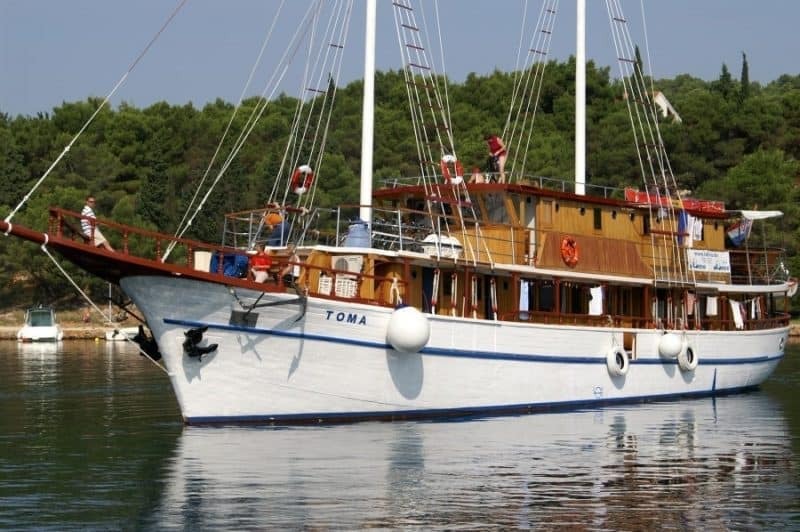 With a fleet of more than 50 traditional wooden ships and steel-hulled vessels fully stocked with luxurious cabins, private baths, and all the bells and whistles, tourists can explore tons of locations around Europe comfortably. And that includes land. Katarina Line doesn’t restrict its guests to the water. Tourists can explore Croatia, parts of Italy, Hungary, Slovenia, Bosnia and Herzegovina, and Montenegro through Katarina Line. Katarina Line’s Marketing Director, Daniel Hauptfeld. You don’t have to choose between a land tour and a cruise because Katarina Line’s land tours are designed to either precede or follow cruise tours. And according to Katarina Line’s Marketing Director Daniel Hauptfeld, the option of such a vacation is becoming very popular. Don’t worry about what hotel you’ll be staying at. Just know that Katarina Line’s land tours include a minimum of 4-star hotels. Customers can even request customized tours with varying levels of accommodations. Katarina Line’s cruises come with welcome receptions and cocktails, drinking water, complimentary wi-fi, and anywhere from 10 to 19 cabins. There are six different categories of accommodations across the company’s expansive fleet. A moonlight deck aboard one of Katarina Line’s Deluxe Superior vessels. You’re not going to be able to see Europe in all its natural and historic beauty as easily as you will on a Katarina Line tour. Daniel Hauptfeld says, “Our guests have the opportunity to explore the stunning natural environment and historical, quaint Mediterranean towns of Croatia and its neighbors, experiencing their unique culture and wonderful cuisine, some of which are famous throughout the world. The historical, environmental, and cultural significance of the places you’ll see on a Katarina Line tour is staggering. There are multiple national parks, some of which are UNESCO World Heritage Sites. Spots like Zadar, Korcula, and Hvar are as picturesque as they are historic. With no night cruising, tourists have the opportunity to explore port towns’ various attractions and cuisine at night while the cruise is docked. And with no curfew, there’s no rush to see and do everything you want. Tourists can bike on land to explore the cities and towns on the Katarina Line’s itinerary. The company’s cruises also offer meals that reflect “port-of-call” culinary traditions. Tourists can even join the crew on their grocery shopping excursions to purchase food that will be used on board. And each cruise finale involves a Captain’s dinner with special surprises from cruise staff and live entertainment. With guaranteed departure dates from September 15 to October 6, the nine-day newly expanded “Lakes and Mediterranean Harmony” tour is a “visual and gastronomic adventure,” according to Daniel Hauptfeld. The tour begins in Venice, ends in Split, and brings tourists to scenic locations such as the Alps and the Plitvice Lakes. Historical sites visited on the tour include but are not limited to Croatia’s Pula Arena, the Vrelo Cave in Fuzine, and Bled Castle. The price of the tour includes all transfers by way of modern, air-conditioned buses, multiple meals, olive oil tasting, truffle tasting, knowledgeable English-speaking guides, and admissions fees to all itinerary activities such as lake tours, boat rides, and cave exploration. For more information about the “Lakes and Mediterranean Harmony” tour, as well as Katarina Line’s other available tours, click here. Obviously, the cost for Katarina Line tours varies based on the dimensions of your trip. Costs for tours depend on the category of the ship, the accommodations, the number of excursions, and amenities. Katarina Line tours can include tons of amenities, incredible gastronomical experiences, entrance fees to certain attractions, and much more. Some tours will actually include the cost of airport transfers – Wow! You certainly get a whole lot for what you pay! Don’t miss out on the vacation of a lifetime, click here to get more information about Katarina Line tours!